A young American man named David is in the South of France, his girlfriend having just left to return to the US. David is about to return to Paris where Giovanni is being executed. He reveals the story of how he met Giovanni at a gay bar he visited with his friend Jacques, and how he began a relationship with Giovanni, eventually moving in with him. He knew it wouldn't last as his girlfriend Hella was in Spain only temporarily and would return, but Giovanni hoped otherwise. Eventually we learn what a huge mess David has made of everything and why Giovanni is being executed. This is a very short book (my edition was 170 pages) but one packed with beautiful language and emotion. The atmosphere was one of a sort of tragic hedonism. David and his friends Jacques, Guillaume, and of course Giovanni drank a lot and drifted about aimlessly and hurt each other, sometimes intentionally and sometimes not. The language almost romanticized it at times, but also sharply conveyed the more sordid and ugly parts. Considered a gay classic, Baldwin's publisher apparently initially balked at it because of the content. More recently, it has been acknowledged to be bisexual - it seems weird that it wouldn't have before, but I guess it took a while to accept that bisexuality is actually a thing. David had a relationship with a boy before when he was young, but he also loves Hella and does want to marry her. Even Giovanni also had a woman in his life before he and David met, and one with whom he shared a loving relationship before it ended with tragedy. This is the cover of the edition I read and it's a little odd - I never understand why occasionally an author's photo appears on the front cover. I would understand if the novel was more autobiographical, but I don't think this one is. Also, from what I can tell, the characters are all white. (David is described as blond and Giovanni is Italian.) But of course this is just one of many editions, I just really enjoy a beautiful cover and this one doesn't do justice to the story within. 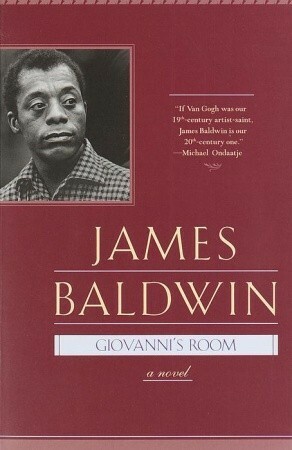 I can't believe I haven't read James Baldwin before. Why did nobody tell me how lovely his writing is, and how compellingly genuine his characters? I know he also wrote a lot of nonfiction in the form of essays, as well as short stories, plays, and poetry, so there's a lot to choose from. If you have suggestions about what I should try next, please let me know in the comments!